The notice from Kaiser came in the mail about ten days ago. Luke Donavan's health insurance premiums were going up. A lot. 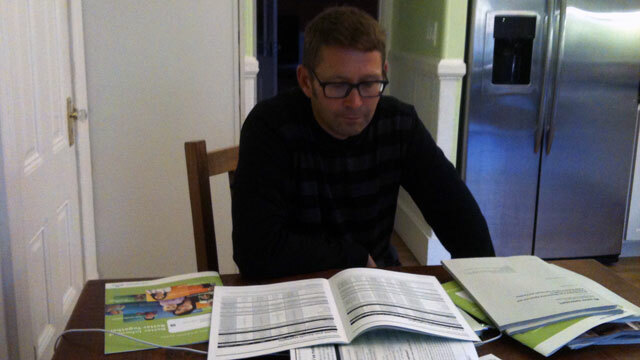 Donavan, 41 of San Francisco, is self-employed and buys his own health insurance. Currently he pays $841 per month for insurance for himself, his wife and three young children. But, Kaiser is canceling that policy and offering him a new one that fully complies with the Affordable Care Act. Effective Jan. 1, his family's premium is going up to $1,000, with a higher deductible. Donavan says he voted for Obama in both elections and calls himself a "big proponent" of the health law. He has a pretty calm demeanor and says he was "surprised" by this news from Kaiser. "I just keep coming back to the name 'Affordable Care Act,'" he said. "I thought I'd pay the same or less for better coverage." Subsidies are available for people to buy insurance, but they are dependent on income. Donavan says he earns too much to qualify. Indeed, nationally, a recent study from the non-partisan Kaiser Family Foundation (not affiliated with Kaiser Permanente) found that just over half of people currently buying insurance on the individual market will see their premiums go down. Larry Levitt, senior vice president with the foundation, says that Donavan's situation "encapsulates the diversity of experiences" that people are likely to have with Obamacare. Some people may pay higher premiums, he said, "and the reason those premiums are going up is because people with pre-existing conditions will now be able to get insurance, and those people often have very high medical bills. That money has to come from somewhere." The law mandates more comprehensive coverage starting in 2014. This means more services will be covered by insurance. ... As a result of these improvements, the cost of coverage – in the form of the monthly premium – will increase for some members, simply to pay for the expanded coverage. It’s important to note that individuals with some of the more expensive coverage plans – high-benefit plans, and others such as COBRA continuation plans – may see lower premiums next year. But all this background is little comfort for Donavan. He acknowledges that his out-of-pocket maximum is less, and his new policy "definitely protects from catastrophic bankruptcy situations, but most people, the first thing you think about is what's my monthly and what's my deductible." Those are both more expensive under his new policy. This post has been updated to clarify that Donavan buys his own insurance and that he received notice his policy was canceled.